The Gourmet Chocolate of the Month Club, one of the many membership options offered by MonthlyClubs.com, focuses on artisan chocolates from around the world. Each month subscribers can expect to receive hand-crafted boutique chocolates from local and international chocolatiers. Even more impressive, they offer all of this at an affordable per shipment price. The Gourmet Chocolate of the Month Club focuses on high-end chocolates from around the world. 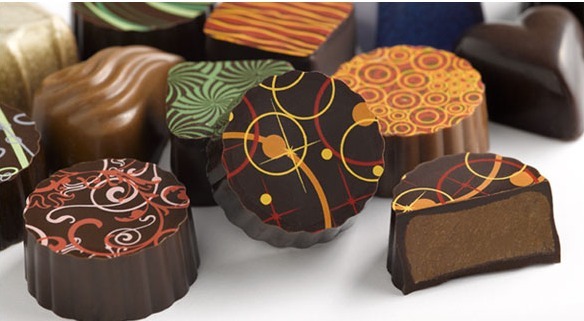 Members are not restricted to a single brand or chocolatier – instead, the company strives to bring them selections that are unique each month and rarely repeat selections. Members cannot pick if they want dark, milk or any variety of chocolate; instead, part of the thrill of the membership is receiving something completely new and unique. Because they are all gourmet chocolates, the chocolates will be of much better quality than a member could find in their local store and they are likely to be exposed to companies they have never even heard of. There is nothing more distinct than gourmet artisan chocolates. These are not mass-produced in a factory; instead, they are handcrafted and in most cases, hand-dipped by a chocolatier. Each batch has its own unique flavor and personality and the ingredients used in the Gourmet Chocolate of the Month Club selections can range from simple to extraordinary. Just some of the innovative ingredients found in their chocolate selections include cardamom, pear black tea, wasabi, caramelized ginger, and other unique accents. They feature some exciting, bold flavors in their shipments and even locally-owned ingredients are incorporated into the chocolates. The membership options is where the Gourmet Chocolate of the Month Club could use a little improvement. They only have one membership choice, which may make some members feel too limited. Each shipment comes with one pound of chocolate, but the number of chocolate pieces in the shipment will vary – depending on how large/heavy they are and what makes up one pound. The price is $34.95 per month and shipping is in addition to the monthly fee. Members can opt for bi-monthly or quarterly shipments instead of monthly, but they only have the single membership of $34.95 to choose from. There are unique perks to joining with the Gourmet Chocolate of the Month Club. One of the biggest is that a member can also join other monthly club memberships, such as a cheese of the month or even wine of the month club. Members cannot reorder chocolates they liked at a discounted price; instead, the chocolates are reserved just for the monthly shipments. In each shipment members will receive their hand-crafted chocolates and a monthly newsletter. The newsletter has detailed tasting notes, a profile on the chocolatier, the history of that chocolate and serving suggestions for added fun. Shipments arrive on the second or third week of every month and shipping is $14 per shipment. The only states they do not ship to are Hawaii and Alaska. Shipments are packed with the perishable nature of the chocolate in mind, however there is no signature required to receive them. The company does not specify how they handle chocolates during the hot summer months, but they do advise that someone be home on delivery day to immediately accept the package. The packaging of the chocolates themselves depends on the chocolatier making them, but each is wrapped in a box with ribbon. The Gourmet Chocolate of the Month Club's single membership can be purchased for yourself or given to someone as a gift. When selecting the membership as a gift, a customized gift announcement will be sent out before the first shipment – notifying the recipient that they have been gifted a membership. Also, a personalized gift message will be included. The website features all of the information a member would need to decide if the Gourmet Chocolate of the Month Club is right for them. They can order their membership online, preview the annual chocolate calendar to see what chocolates are expected and even adjust their membership by logging in. Members cannot specify their chocolate profile, but they can skip a shipment if they will not be home to receive it. Customer support and service is excellent with the Gourmet Chocolate of the Month Club. They allow members and prospective members to contact them toll-free Monday through Friday from 7am to 5pm PST or they can request assistance via email. All customer support requests, however, are shared with other monthly clubs and the service is not limited to just the chocolate club. During the holidays some members may experience longer wait times because of this. Gourmet Chocolate of the Month Club: Receive one pound of hand-crafted chocolates, newsletter and tasting information each month, bi-monthly or quarterly. Starts at $34.95 per shipment plus $14.00 shipping and handling for a total of $48.95 per shipment. The Gourmet Chocolate of the Month Club offers unique chocolate selections, but the price can be steep for some – at about $48.95 per pound. That being said, this is a great membership for gift recipients as well as those new to chocolate of the month clubs. If you are trying to explore chocolates outside of what you can get locally, this is definitely a club to consider. If you have more refined tastes, you will still enjoy the shipments that you receive from the Gourmet Chocolate of the Month Club – which makes them ideal for just about everyone. We really enjoy the fact that the Gourmet Chocolate of the Month Club is devoted to artisan chocolates. They don't do garden-variety selections and they try to explore tastes and local flavors from around the world – bringing you something truly unique in each shipment. It is great that you cannot find these at your local store – so it makes that membership that much more special. One thing we do notice is that they have a higher price per pound and the shipping is in addition to the membership – which may limit some members to just a few shipments before they have to cancel. We like that they go for very exotic ingredients and then balance it out with things like local Vermont maple syrup. We also like that they include tasting notes and a profile about the chocolatier behind the chocolate itself – it lets people see that these are truly artisan creations and not factory-generated candy. Overall, we are very impressed with the Gourmet Chocolate of the Month Club shipments and their offerings. A monthly chocolate club that can be paired with other monthly clubs for a whole bunch of tasty deliveries. While they only have one membership, you get rare and unique artisan chocolates from around the world in a single membership. $34.95 Save $15 or $10 NOW!